Save SAR 3 (33.33%) – Earn 1 Shukran What is Shukran? Shukran is the Landmark Group’s award-winning loyalty programme in the Middle East, which allows you to earn Shukrans when you shop any of our brands. Give an earthy touch to your dining room by using this modern and attractive placemat. 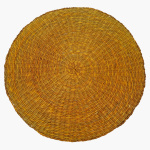 Featuring round shape and finely textured, this placemat will keep your table surface from getting scratched.